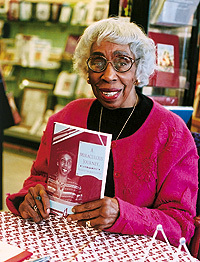 Frances Walker-Slocum (2006) holding A Miraculous Life, photo by John Seyfried, Source, accessed 18 July 2016. Location: George Theophilus Walker Former Student File, Record Group 28/2, Box 1075, O. C. A. This document is a transcription of an interview Mary Lynne Allen, then an Oberlin undergraduate piano student, conducted with Frances Walker-Slocum. This excerpt is only time Allen explicitly addressed race and gender in her questions. During the interview Allen and Walker-Slocum discussed her retirement, early experiences with piano, and her relationship and at times, competition, with her brother. Walker-Slocum adapted this interview into a chapter, “Concert in 1975,” in her memoir, A Miraculous Life. Paragraph breaks have been added for easier reading. MLA: How have you been socially or personally involved in music, for instance, have you been particularly interested in any women or black composers? How did you decide what to program? Who were your influences, etc.? FW: I loved to get a program together. To me, it’s like giving birth. It takes a whole lot for me to get a program together of things I like, I do well, and will interest the audience. The one great thing in my life that changed my life entirely was purely fateful. I remember the bicentennial [sic], for 1976, people were coming out with the first of this, the first of that, and I thought, when can I get something first? Then, I got this letter from the director of the National Gallery of Art in Washington. He wrote and asked if I could do a program of American composers. I wrote back I would be delighted and I sent him the program, and he wrote back and said, “I said Black American composers.” Oh, ‘cause [sic] I could program the Griffith [sic] sonata which I did [etc.] The program came about when I was teaching at Lincoln University, and Ategita [sp?] [sic] Haynes, who was part of the first Black Trio, whose husband founded the Urban League, asked the librarian of the University to bring me to lunch. I didn’t know her at the time. She must have been in her eighties by then. When I was there, she said, “why don’t we go upstairs and look at my husband’s papers. Would you like to look at this music of black composers that I have?” I sat down and was just dumbfounded. That’s how I got my hands on all this music of black composers. Of course, I knew my brother, and Nathaniel Dett I knew ‘cause [sic] I’d heard him play, but all these others? I was in ecstasy. I asked her if I could have them, and she wouldn’t let them out of her hands. She said, in her eighties, I’ll xerox them and you can send me the money for them. This was a change. I was able to take this program and make it more acceptable to the public. In other words, more varied. All summer, I worked learning and memorizing this difficult music. To play it. I did it in ‘75, because all these people were coming out with firsts. I didn’t want anybody to come out with music of Black composers for piano and do it before I did. It was all scheduled. It was a beautiful day. My husband dropped me off at the recital hall and I saw a young man standing in the hall. I said, “Hello, may I help you? Are you waiting for someone?” He said, “I’m waiting for you.” Oooh, [sic] well the people poured into that Hall. We turned at least 50 people away. I had invited the composers who were alive at that time, and when I finished playing their pieces, I gestured to them to stand and they stood up. The people went wild. I received a standing ovation at intermission, and at the end of the concert, people were weeping. They knew I could play traditional, but this was my ticket to any importance that I have received. I got a manager from that, concerts from that, and it’s how I got my job here [Oberlin] [sic]. They saw the review, which was marvelous, and Mr. Melcher, who was not one of my teachers, said to Danenberg, why don’t we invite her here and have her play the program here. So, David Boe called the manager and she called me. She said, “I don’t know how much to charge because I don’t know how you feel about Oberlin.” I said I feel nothing about Oberlin. I had a tough time at Oberlin and I still have a chip on my shoulder. It should be over by now, but it’s not. I said, if they want me they’re going to have to pay. David Boe said he was asked to play for his Alma Mater and he didn’t charge them anything. I said that’s his business. Because I had the manager, they paid me a fee plus expenses and to stay at the Inn. When it was time for me to perform, I was scared to death. The music was modern. The Howard Hansen sonata was totally dissonant. I felt maybe I better put the music up [in front of me] which I didn’t do in New York. I said, can you find me a page turner, I think I’d like to have this music up. They found, you know, Paul Mast. I think that’s how we started off on good terms. He told me afterwards, “you know you only looked up at that music once.” I said, “I know, but if I hadn’t looked at it once, I might have forgotten it.” That’s how I got the job here. They told me when you go home, send you [your] resume to David Boe, and he’ll give it to the person who’s in charge because there was going to be a vacancy, and the vacancy was Rodunsky [sic]. They sent me back the job description and the pay level, which was very low. They told me they’d let me know April 15th. April 15th came and went. I had the job at Rutgers. I would take my husband to the subway and then I would stop at McDonald’s for coffee cake and coffee. Listen to WQXM personalities and read the paper. Then I would go home and practice. This day, something said to me, don’t run your errands, go straight home. This was about 9:30. I came in the house, and the telephone was ringing and it was David Boe, trying to get something for nothing. That was how I got here. I realized that the problems I had with the piano department were because Danenberg went over their heads. He pushed out a teacher to get me in. A black woman singer who did not get her tenure was suing them. So, clever, they say, we aren’t prejudice, we have a black woman here like Frances Walker. He told me himself. That retirement party was the best time I ever had in Oberlin. With Garth Peacock, and Priscilla Smith, the place was jammed. I said I felt as if I were attending my own funeral. Boy, did they go on, even Peter Takacs. David got up and praised me to the skies. He talked about my family, my brother, my students, and everything. He said there’s something I don’t even think Frances knows, in other words, how I was hired. But I already knew, Danenberg told me. It was really funny. They really treated me like a queen. I wish they had done it earlier. Nevertheless, the experience, I never felt I would have the chance to teach gifted people, and that’s what Oberlin did for me. I would like to go for periods of time, like residencies, and just work and guide students on the right path now. There are a lot of good people in that field now, and they may not want..they may just consider me a threat. I have to judge a major competition at the Kennedy Center in March and I’m one of the three judges. Lidia [sic] Frumkin is weeding them out before they get to us. I’m looking forward to that, and to get back into Washington and see what I can do. I don’t want to teach full time again. It’s been a tremendously interesting life. I met my husband in Toogaloo, [sic] that was fate. I didn’t know him at Oberlin, never saw him. I was at the World’s Fair, and he was there as a boy scout, I didn’t meet him there. He was a strong supporter. In fact, he asked me before we were married, “how much do you like this music, anyway, because you know when we get married, you’re not going to be able to practice.” I said, “well, I don’t like it that much.” I knew I was lying. I figured, I get my ring on my finger, and if it didn’t work out, ha, ha, Just [sic] to get that “Mrs.” handle, was very important in those days. You can’t get out of marriage that easily. In fact, you tend to fall more in love if it’s a good marriage. I miss him terribly. I got this house for him when I found out that I had tenure [at Oberlin] [sic]. He was involved in things here just before he died suddenly. Charles Tomlinson Griffes’s “Sonata” (1917-1918). Olyve Jeter Haynes (1898-1984) and George Edmund Haynes (1881-1960) were married in 1955. George co-founded the National Urban League and served as its executive director from 1911 to 1918. The Urban League was a New York City-based civil rights group which advocated against racial discrimination. In more than one instance they sought to promote Black classical musicians. In another review by Donal Henehan (See Document 1 for a review of Walker-Slocum), Sanford Allen reflected on his life as the first Black member of The New York Philharmonic at the time. He wrote that “responding to heavy pressure from the Urban League, he auditioned for a regular Philharmonic position, and was accepted” (Donal Henehan, “Only Black in Philharmonic is Resigning After 15 Years,” The New York Times, 29 August 1977, Source, accessed 15 July 2016). Robert Melcher (1910-1983) was an Oberlin College music theory professor and graduate (Robert A. Melcher Papers Finding Guide, Oberlin College Archives, Oberlin College, Source, accessed 15 July 2016). Emil Danenberg (1917-1982) was hired to teach piano at Oberlin Conservatory as an instructor in 1944, and became a professor in 1960. He then served as Dean of the Conservatory, during the time of Walker-Slocum’s recollection in this interview (Emil C. Danenberg Presidential Papers Finding Guide, Oberlin College Archives, Oberlin College, Source, accessed 15 July 2016). David Boe (1936-present) taught organ at Oberlin Conservatory from 1962 to 2008. He also served as Dean of the Conservatory during his time, as he wrote Walker-Slocum’s tenure review (see Document 5). Walker-Slocum identified this chip on her shoulder in A Miraculous Life, as a series of racist remarks from her professor while she was an undergraduate at Oberlin. The eurythmics professor Inda Howland used to “yell across the room, ‘Walker, stick your tail in,’” which Walker-Slocum reminded her of when they met again at Oberlin at her Bicentennial Program reception. She felt she “had gotten rid of the ‘log’ that had sat on [her] shoulder all those years” (Frances Walker-Slocum, A Miraculous Life (Bloomington, Indiana: AuthorHouse, 2006), 144). Paul Mast (1933-2014) was a renowned jazz musician who traveled nationally, always returning to Toledo, Ohio (“John Mast,” The Blade, Source, accessed 15 July 2016). Jacob “Jack” Radunsky (1909-1995) taught piano at Oberlin Conservatory from 1947 to 1976. He earned a praiseworthy national reputation while having total commitment to his students, much like Walker-Slocum (Jacob “Jack” Radunsky, Oberlin College Archives Biographical Sketch, Oberlin College, Source, accessed 15 July 2016). Garth Peacock (1928-2007) was an organ professor at Oberlin Conservatory from 1959 to 1991. He received his undergraduate degree from Oberlin in 1951 (Laurel Fuson, “Garson Peacock Passes Away,” The Oberlin Review, 13 October 2007, Source, accessed 15 July 2016). Priscilla Smith (1926-2001) taught cello at Oberlin Conservatory from 1973 to 1991 (“Priscilla Alice Smith,” Oberlin Alumni Magazine, Summer 2001, Vol. 97, No. 1, Source, accessed 15 July 2016). Peter Tackas (1946-present) is a professor of piano at Oberlin Conservatory. See more at his faculty profile. Lydia Frumkin (1947-present) is a former professor of piano at Oberlin Conservatory. She has toured and taught internationally, and now teaches at Washington Conservatory of Music (Washington Conservatory of Music Faculty, Source, accessed 15 July 2016). George Walker composed this piece in 1987 and dedicated it to Frances-Slocum. In an address honoring Walker, it was said that Walker dedicated many of his pieces to Walker-Slocum, and “she in turn has taught many of her brother’s compositions to her students. ‘But,’ she cautions, ‘his music is very difficult. I only taught it to very advanced and interested students’” (Some Welcome Remarks, With Attention to Our Special Guest, Dr. George Theophilus Walker,” George Theophilus Walker Former Student File, RG 28/2, Box 1075, O. C. A.). Guido of Arezzo (Guido d’Arezzo) (991/992 – after 1033) was an Italian music theorist, who invented staff notation. The program, “The Music of George Walker,” was given on 9 June 1991 in The Newark Museum. The performers included Chaminade String Quartet, Renay Farrer (soprano), Cyrus Stevens (violin), Colette Valentine (piano), and Frances Walker-Slocum (piano). They performed String Quartet, no. 1 (1946), Songs for Voice and Piano (text by Emily Dickinson) (1983), Sonata no. 2 for Piano (1957), Sonata no. 2 for Violin and Piano (1979), Songs for Voice and Piano, Sonata no. 1 for Piano (1953) (Programs of Non-Oberlin Recitals, Frances Walker-Slocum Papers, RG 30/222, Box 1, O. C. A.). Audiotape. The interview was recorded originally.